Food and beverage companies are tasked with keeping up with a constantly evolving industry and customers’ expectations. Though this often results in fresh and exciting ideas for new products that customers love, it’s inevitable that some of them aren’t as appetizing. 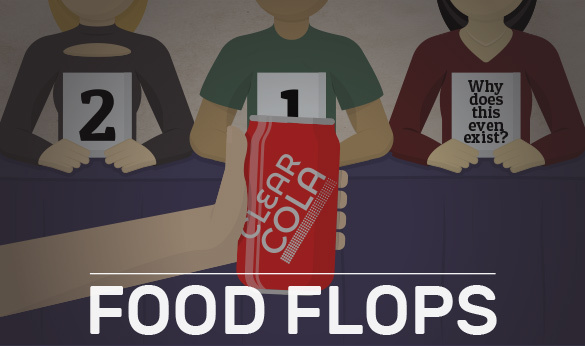 Here are some of the biggest food flops in recent history, some of which you might have been “lucky” enough to try when they were available. Starbucks debuted the Chantico in January 2005. 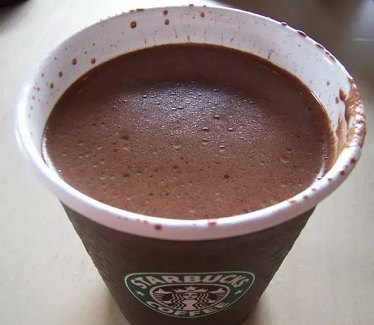 The very rich chocolate drink packed 390 calories into a 6-ounce cup and was said to resemble “a melted truffle” by a company spokesperson. While the drinkable dessert attracted diehard fans, it didn’t sell well and only lasted 11 months on the menu. For those who miss the drink, there’s a number of copycat recipes available online. Following its debut in Europe, Crystal Pepsi was introduced to Americans in 1992. The initial reception was positive, but sales dropped quickly after a suicidal kamikaze drink, Tab Clear, was introduced by Coca-Cola in a bid to take out the entire clear cola category. 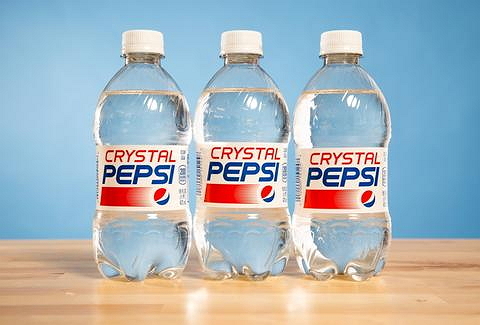 Crystal Pepsi was discontinued in early 1994, but amidst continual demands for its return – including a petition that gathered 37,000 signatures – the drink returned for several limited runs between 2015 and 2017. In most cases, if you found a bottle of green ketchup, you would assume it had gone very, very bad, but for a few years in the early 2000s, it was all the rage. 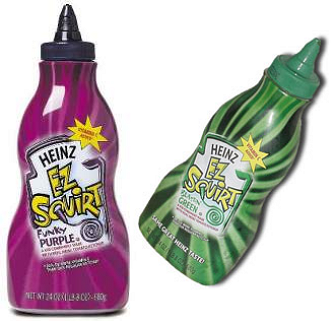 In 2000, Heinz introduced the Heinz EZ Squirt, which introduced both a narrow nozzle for drawing on food and a “Blastin’ Green” color. This food flop actually had a strong start – the green color was so successful, the company followed up with purple, a mystery color (which could turn out to be purple, orange, or teal), and blue. While the colorful condiments experienced initial success and ultimately sold 25 million units, the novelty of the crazy colors wore off over the next few years, and the line was discontinued in 2006. Gerber has long been the leader in the baby food sector, but that sector’s fluctuations once led to concerns among company executives. Between 1960 and 1972, births per year declined from 4.2 million to 3.2 million, leaving Gerber scrambling to cover those lost profits. 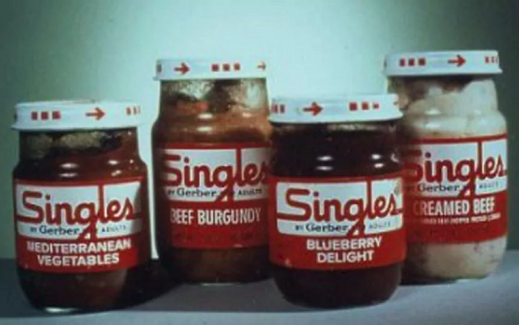 One recovery attempt was Gerber Singles, which greatly resembled the company’s baby food – pureed meat, vegetables, and fruit – but was packaged in larger jars and marketed to young adults. The idea was to provide an easy meal for those living on their own for the first time, but it turned out that not many adults were keen on eating mush, so it didn’t last very long. 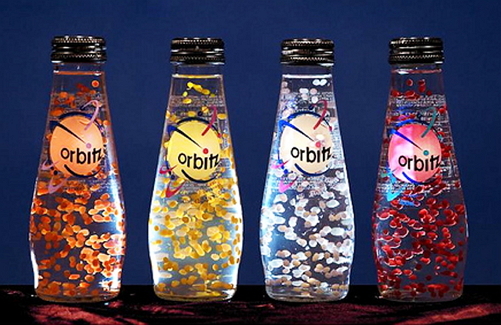 You might be wondering what a travel website is doing on a list of failed food products, but before the term was associated with flights and hotels, it was a drink – or, at least, something like a drink, since beverage brand Clearly Canadian dubbed Orbitz a “texturally enhanced alternative beverage.” Introduced in 1997, the bottles actually looked more like lava lamps, with colored globules floating in a clear liquid. Confusing flavor names included “Blueberry Melon Strawberry” and “Pineapple Banana Cherry Coconut,” but according to some, it all actually tasted like what they imagined the inside of a lava lamp might taste like. Unsurprisingly, sales were abysmal and the drink was discontinued less than a year later. Before Pepsi suffered its Crystal failure, the folks at Coca-Cola experienced their own product miscalculation in 1985. However, New Coke was arguably an even worse blunder, considering the company not only introduced a new soda, it used it to replace its biggest seller. 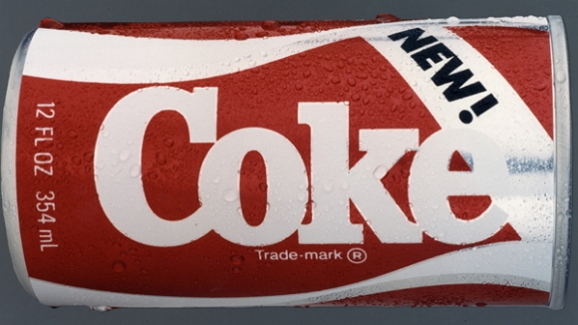 In April 1985, Coca-Cola underwent its first recipe change in 99 years, and customers hated it. Only 13 percent of soda drinkers liked the new formula, and habitual Coke drinkers loathed it so much that the new drink prompted calls, letters, protests, and even the formation of The Old Cola Drinkers of America, a group that grew to 100,000 strong before the company capitulated only four months after New Coke’s introduction, switching back to what is now known as Coca-Cola Classic in July 1985. The fiasco became a pop culture punchline, with author Winston Groom satirically blaming the failed rollout and a fictional riot in Atlanta on the titular character of Forrest Gump in the sequel Gump & Co.